E-Fun is clearly planning to undercut more than just Kindle Fire and Nook tablet sales this coming year; they've just released some details on a new 8" budget tablet that will be revealed at CES next week and sell for $170 this spring. The Nextbook 8GP has specs similar to E-Fun's soon-to-be-released 7" tablet. It's going to run Android 4.1 on a dual-core 1.5GHz CPU with 1GB RAM, a pair of cameras, and an HDMI port. Screen resolution wasn't mentioned in the press release, but the screen is described as a high resolution IPS panel. 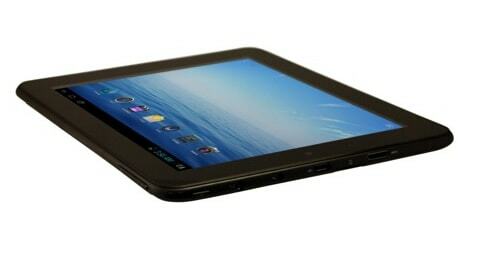 This tablet also has 8GB Flash storage, a microSD card slot, g-sensor, mike/speakers, and Wifi(n). One of the more important details for this tablet is that it will ship with Google Play. This is going to be the third tablet launched by E-Fun with Google's content store, making it one of a number of budget tablets with it. That is noteworthy. Either Google is lowering the bar on admission to their exclusive club, or the budget market is getting crowded enough that some competitors feel the need to step up their game. Either way, it's a sign that major changes are coming to the Android tablet market this year. I expect Google lowered the bar. Amazon really lit a fire under them last spring; first they improved and renamed the store and now they are licensing it to all crappad vendors they can. Otherwise, crappad buyers would be buying their apps from Amazon. That’s my thought as well, but it might not be true. On the other hand, if this were simply a cost and time issue then Coby has the pockets deep enough to have paid for it last year. If they’re adding Google Play this year then odds are they simply could not do it before. I wouldn’t be surprised if Google Certification for these craptabs is fallout from the FTC investigation. And I’d expect screen res to be not lower than 1204 x 768. With eFun and Coby — and Velocity Micro — releasing 8″ tablets, they’re all suddenly iPad Mini wannabes and everyone forgets that it was screwy Archos that did an 8″ tablet first (and it was 1024 x 768 too). And, eh, specs say nothing about how they actually *work*. Man, was that first Pandigital Novel a damn disappointment at the time! That first Novel is still crap. Velocity Micro is releasing an 8 incher? I only have heard of their 10 inchers. I only know of the 2 10″ models. And zero posts on YouTube, so I doubt anyone bought it. And it seems no one even requested a review unit. I think that one has been out since July. It’s part of the 2012 gen tablets: single core CPU, no Google Play, etc. But did not become available til like October or November. I was lusting for it for a while. So it was released 6 months after it should have been and only 3 months before the new and better stuff is announced? Yep. that is VM all over. Not only that, they totally ignored my tweets to them about it. Way to diss people who are actually *interested* in your product! And Alcatel raises the damn bar! Just 8GB internal storage, but does that still matter? Don’t most Andy apps install fine on microSD these days? And 64GB is getting cheaper every day.